This smoothie bowl creation came about on a very hot day when I had 5 minutes to throw lunch together. It was inspired by the amazing Acai Bowls made by The Golden Sparrow in Bayport – a gem of a healthy market that serves vegetarian fare, juices, coffees and teas. You should definitely check out it if you haven’t already done so. 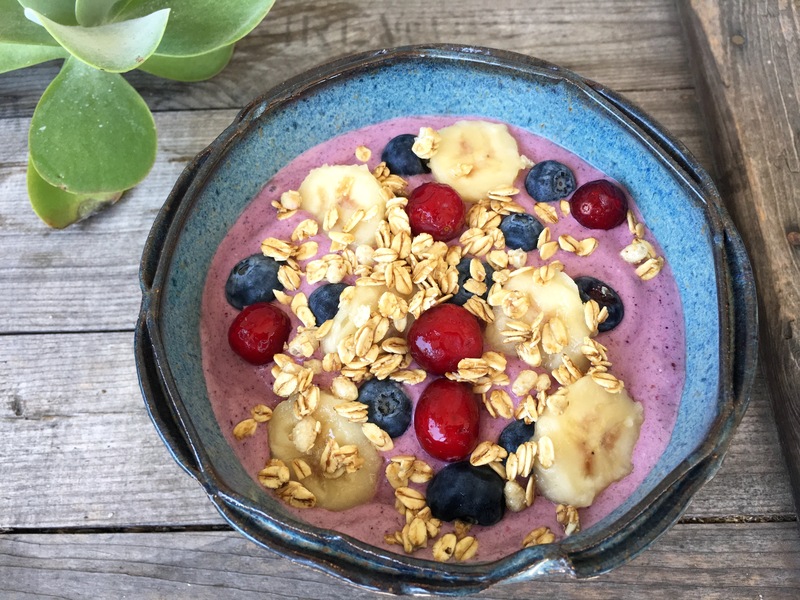 This Smoothie Bowl makes a good meal on the fly – just be sure to add the hemp seeds and coconut milk and/or coconut butter if you want to make a meal of it. The hemp seeds add protein and the coconut milk adds healthy fat – both of which satiate hunger, and keep your blood sugar and energy level from spiking and crashing. Coconut butter (aka coconut manna) is coconut meat ground into a butter like peanuts are ground into peanut butter. I’ve been using the Sunrise Growers Frozen Organic Antioxidant Berry Blend from Costco and Bear Naked granola. To attain a super thick consistency, I use frozen bananas. You can too. Here’s how: Peel a bunch of ripe bananas, lay them on a flat plate or tray and put in the freezer. Once frozen, throw them in a ziploc bag so they’re ready when you need them. Feel free to substitute another kind of milk, or even yogurt, for the coconut milk. If you make it, I’d love it if you let me know what you think in the comment section. 1. Add all ingredients, in the order listed, (except for toppings) into a blender. Whiz it up until blended. 2. Pour into a bowl. Garnish with toppings.